One or two session workshops on specific subjects for dog friendly dogs working on patience/impulsiveness issues like jumping up, improving and proofing the sit, leash pulling, visitors arriving. More.. Ideal for dogs that are not so confident around other dogs but must be human sociable. These classes are not for human reactive dogs. Really fantastic help and advice. I now have lots of notes and a personalised programme to go through with my dog Kiki. Tamasine couldn't be more helpful and always ready to give advice on WhatsApp when you need it! Bark Review Really fantastic help and advice. I now have lots of notes and a personalised programme to go through with my dog Kiki. Tamasine couldn't be more helpful and always ready to give advice on WhatsApp when you need it! Tamasine responded to our cry for help with our 8 month old Labrador, offering lots of email support before we even committed to a home visit. We saw just by using the emailed information a marked improvement in Maisie’s behaviour so booked a home visit to learn some more good practices. From the moment Tamasine walked through our door everything she demonstrated made sense. Maisie is not our first Labrador but hadn’t come across this impulsivity/lack of frustration tolerance before to this degree. Tamasine explained all this the why and how’s she was excellent. Went over and above her time with us and is still there for support. No taking her money and that’s it. We have a detailed programme to follow emailed quickly to us . We are already noticing a difference in Maisie’s behaviour. Just can’t thank Tamasine enough. 5 Star Bark Review Tamasine responded to our cry for help with our 8 month old Labrador, offering lots of email support before we even committed to a home visit. We saw just by using the emailed information a marked improvement in Maisie’s behaviour so booked a home visit to learn some more good practices. From the moment Tamasine walked through our door everything she demonstrated made sense. Maisie is not our first Labrador but hadn’t come across this impulsivity/lack of frustration tolerance before to this degree. Tamasine explained all this the why and how’s she was excellent. Went over and above her time with us and is still there for support. No taking her money and that’s it. We have a detailed programme to follow emailed quickly to us . We are already noticing a difference in Maisie’s behaviour. Just can’t thank Tamasine enough. Hello, things are going really well with Nelson. His concentration is so good now and he is definitely focused on us, when we are out we sit and treat him when other dogs are around and he is only interested in us. Yesterday we took him to our local, the first time for about 8 weeks, and he was brilliant. We asked the landlady beforehand not to feed him and when he first saw her it was the old Nelson but we got his attention straight away and it ended up with her walking right by him and he took no notice, he was a pleasure to have in there and we cannot believe the change in him. Tamasine was brilliant with Basil and certainly knows her stuff! She gave me step by step demonstrations of exercises I could do with Basil to keep him calm and control his greed, which I am now putting into practice. Tamasine was very patient with me as I struggle to remember instructions and suffer with high levels of anxiety. Tamasine was extremely professional, very friendly, polite and made me feel at ease. Our session was backed up with demonstration videos and an invitation to contact Tamasine if I need further guidance or have any questions. I would highly recommend Tamasine and will be calling upon her services again in the near future. 5 Star Bark Review Tamasine was brilliant with Basil and certainly knows her stuff! She gave me step by step demonstrations of exercises I could do with Basil to keep him calm and control his greed, which I am now putting into practice. Tamasine was very patient with me as I struggle to remember instructions and suffer with high levels of anxiety. Tamasine was extremely professional, very friendly, polite and made me feel at ease. 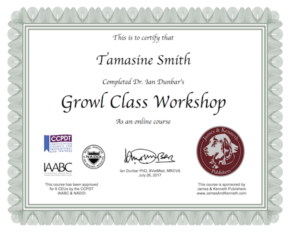 Our session was backed up with demonstration videos and an invitation to contact Tamasine if I need further guidance or have any questions. I would highly recommend Tamasine and will be calling upon her services again in the near future. Tamasine of Leadchanges is superb! Cannot rate her highly enough! She is not just fantastic in the session itself, but with continuing support in preparation for the session (getting to know us, our dogs and determining exactly what we needed from the session) but ongoing, with a report following the session, and actively encouraging us to contact her with any queries or concerns. She is professional, yet incredibly friendly, and clearly knows her stuff! I can't thank Tamasine enough for her dedication and expert knowledge in helping me with my very nervous cockerpoo puppy and building her confidence. I would have no reservations recommending her to anyone. The help doesn't stop after the appointment and she genuinely cares about your dog. Google Review I can't thank Tamasine enough for her dedication and expert knowledge in helping me with my very nervous cockerpoo puppy and building her confidence. I would have no reservations recommending her to anyone. The help doesn't stop after the appointment and she genuinely cares about your dog. Milo & I really enjoyed this course, it has given me the basic understanding of how to get Milo to listen to and obey my commands and given us something we can really build upon. Lots of useful information was provided as back up and I will be referring to this constantly. Thank you for an enjoyable course! Tamasine worked with us and our Frenchie Buddy on Friday, and she was amazing. She is clearly very knowledgeable but is also very skilled at identifying the areas that you need some help with and she also managed to make the session fun for all of us. Buddy's response to her was incredible, we have never seen anyone hold his attention for such lengthy periods, and he also clearly enjoyed the stimulation of the training. Tamasine followed up the session with lots of information, including video clips and we are looking forward to starting to embed the training that she has given us but we are also reassured that we can contact Tamasine over the next few weeks if we need to. Google Review Tamasine worked with us and our Frenchie Buddy on Friday, and she was amazing. She is clearly very knowledgeable but is also very skilled at identifying the areas that you need some help with and she also managed to make the session fun for all of us. Buddy's response to her was incredible, we have never seen anyone hold his attention for such lengthy periods, and he also clearly enjoyed the stimulation of the training. Tamasine followed up the session with lots of information, including video clips and we are looking forward to starting to embed the training that she has given us but we are also reassured that we can contact Tamasine over the next few weeks if we need to.